Dahlonega, Ga. – Lumpkin County Development Authority Executive Director Rebecca Shirley gave county commissioners an update on a proposed StruXure Outdoor project during Tuesday’s work session. StruXure Outdoor has requested the development authority assist with financing a capital project consisting of acquisition, improvement, and equipping of an existing industrial building at 122 Ethan Allen Drive adjacent to StruXure’s existing facility. Georgia law allows development authorities to issue revenue bonds to finance land, buildings, and related personal property. StruXure Outdoor is requesting the authority issue revenue bonds in an amount not to exceed $5,000,000. During her update, Shirley said the project would allow the company to expand, create additional jobs and increase the county’s tax base over time. The Development Authority approved an Inducement Resolution March 19 that expresses the intent of the Development Authority to issue bonds to pay costs of the project and to reimburse costs of the project incurred prior to the issuance of the bonds. Nothing within the resolution commits the county to provide a guarantee of payment of any obligation related to the project or the bonds, or with respect to the repayment of principal or interest on the bonds. Any such commitments, if any are made, shall be set forth in the terms of an Intergovernmental Agreement between the Development Authority and the county. Issues discussed during work sessions are typically not voted on until a future voting session. 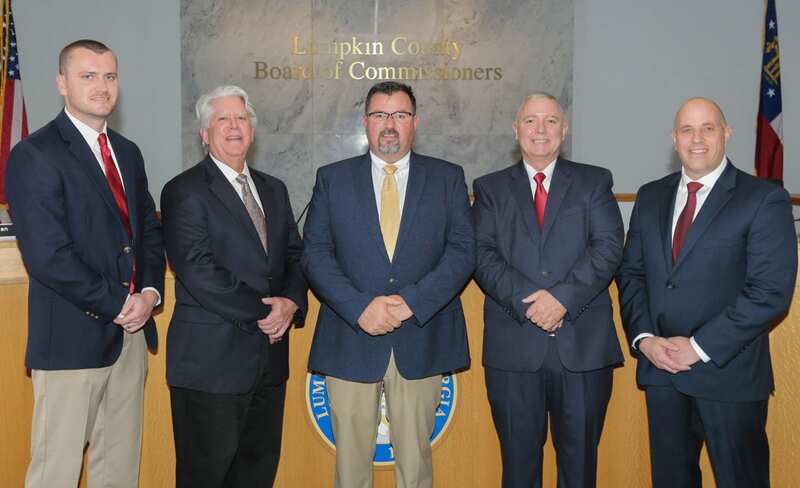 Commissioners also discussed a request for Board approval to use county right of way off Roy Grindle Road by Tommy Williams to facilitate the removal of trash, an old barbed wire fence and some trees from Lumpkin County Parcel 106-213. He is also requesting a waiver of fees associated with tire cleanup and disposal on that same parcel and permission to build a new barbed wire fence. Another issue that generated a great deal of discussion was possible termination of agreement with North Georgia Resource Management Authority (NGRMA) regarding the county’s recycling program. In an effort to increase the efficiency of the recycling program, staff was asked to look into different options that would improve the program. The program, due to the labor intensive process and other issues, cost the county $109,007 to operate in 2018 and generates only $11,402 for a net cost to the county of $97,605. According to staff, that cost does not include the cost of replacement of the truck or containers, which are in need of replacement. Staff presented several options to the Board, but recommended the BOC approve the option that called for withdrawing from the NGRMA and approving the purchase of the new equipment needed to operate the recycling center. Lumpkin County Planning Director Bruce Georgia said staff needed Board guidance to determine if a Special Land Use Application (SLUA) process is required for the Iron Mountain Park Development. The development is located in Lumpkin and Dawson counties. The Lumpkin County portion of the 4,229-acre parcel is located off Hwy 52 West. (2,119 acres in Lumpkin County and 2,110 acres in Dawson County). The specific commercial land uses being proposed are an ATV Trail, Moto Cross Outdoor recreational facilities and an Outdoor Concert Venue.